Recently, following a failed attemp t to get there in May, I visited the home of the two great red varietals of Italy, Sangiovese and Nebbiolo, Brunello de Montalcino and Barolo. Despite the miles in between the two towns and the crazy late night driving along the Mediterranean curve near Genoa, I had a fabulous time visiting both towns. They are held in so much admiration in the wine world of Italy and indeed the whole world and this reputation is growing every day. After the most delightful night in Siena watching the people in the main square and not going un-noticed was the lovely sight of young people not looking at their i-phones but talking to each other enthusiastically! Wow it would be lovely to see a bit more of this in London. But what a city and Square this place is: I love the way it is hidden up and above the town so that if you did not know there was a beautiful city with the most amazing panoramic square that is beyond belief in terms of atmosphere and feel. Do go if you have never been. I skipped Chianti the next morning and headed to the smaller yet to me, far more individual grower of the best the Sangiovese can offer in Italy, Montalcino, which received its DOCG status in the 1970’s. Another beautiful little hillside town, as many wine towns are, Montalcino is located about 20 miles south of Siena on the small road to Rome! It took be about 2 hours to find ” Terralsole” and the vineyard of Mario Bollag and his lovely wife Athena, since the signs are very difficult to follow and no one knows the vineyard when asking! Its not surprising since when I eventually do get on the right road its down the end of a gravel track of about 3 miles, as seems to be nearly always the case! As Athena shows me around the house and cellar ( Mario is tasting 2012 vintages before blending with some of his consultants or friends) she explains to me that Mario was the black sheep of a prominent Basle family in Switzerland and he was an artist who studied at ” Ballata” in Florence in the 70’s. 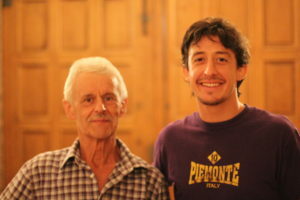 He fell in love with wine as well as art and worked his first vintage in Montalcino in 1990. However ” he wanted a bigger palate” so he bought the land we were walking on in 1993 as well as some land called ” Fonte Latta”, meaning “milk fountain”, since legend has it that if you were short of breast milk for your baby you drank the water from this fountain and the milk would flow. In 1995 he started planting the vines up here and built the house I stood in which was built from scratch. Mario uses 600 litre barrels of French oak from Alier,for his wines and somehting about 220 litre wines and they are nowin the second year of conversion into Organic status. They also have higher elevation vineyards here in Montalcino which means the grapes are far more expressive and these vineyards are called ” Pian Bossolino” up to about 410 metres. What I like about this whole set up is the clear passion for producing some of the most individual Brunello’s that one could possibly wish to find. They are up there in price too mind you but the quality and precision behind the winemaking is wonderful to witness. Mario also does not release his wines too early. 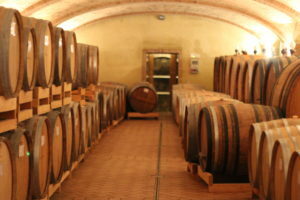 Their present vintage is 2006; 5 years ageing in barrel and two in the bottle. We tasted some 2012’s wines that were at present single vineyard wines. His Reserva 2012 was very soft and elegant, the Trio 2008 was a blend of grapes from other countries, Cabernet franc, Merlot and Syrah and velvety too. 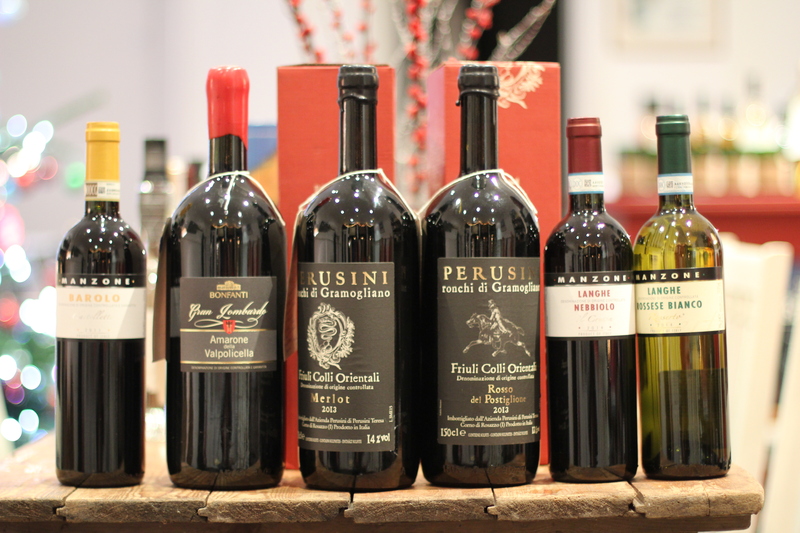 The 2013 ” Milk Fountain” was out of the barrel as well as the 2013 ” Pian Bossolino” which is a special cuvee of “Sangiovese Grosso”. The last wine we tasted was my personal favourite and was called ” Anata” and was a blend of the two vineyards and is clearly going to be an excepttional vintage, very bright and light. I have always loved Barolo. To me its always been the epitome of Italian Winemaking; the “Creme de la Creme”, “The Parsons nose”, The knob-end of the baguette” ( there’s no other way of saying it!). I have thought this since my first visit to this part of Piedmont, on my Ducati 900ss on my way down to see my twin David, who was dancing near Livorno, in 1994. It’s the typical and yet beautiful little hillside town as many wine based towns are in Italy. 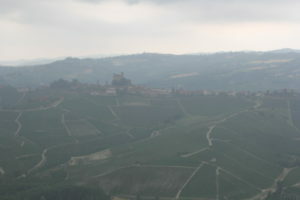 In fact the vineyards have to be located on the hillside to qualify as a Barolo. So for many years I have been looking for some great Barolo and its only now, 15 years into commencing with Whirly wines that I have at last found some wines that I feel are deserving of such a place on my wine shelves here in SW17. 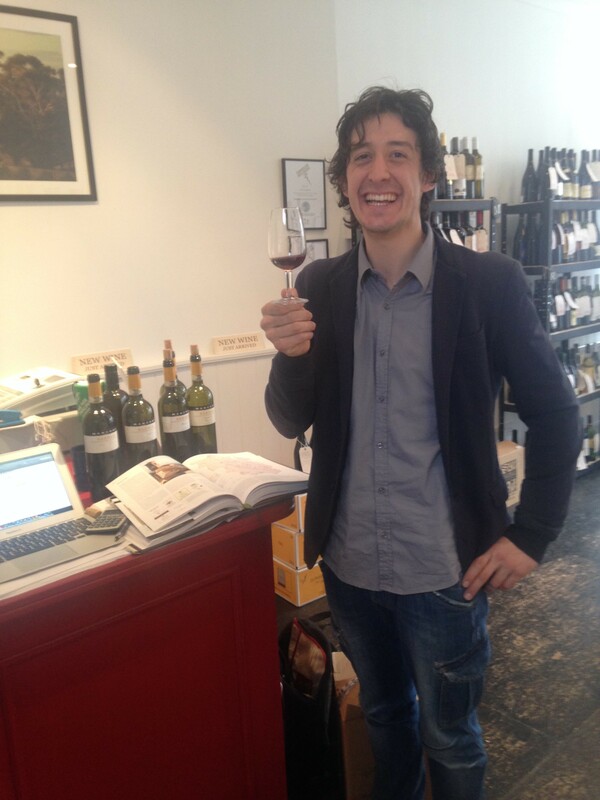 Mauro ( picture below in the Whirly shop this week) is young and a fourth generation winemaker in a little town of Monforte D’Alba, a few miles south of Barolo. His energy and excitement about the wines he showed me was obvious and I am now planning a trip to Piedmont in May for their annual wine tasting. 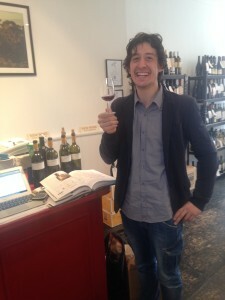 It did not take long for me to realise that I was tasting some special wines. Mauro had been at Cambridge university the night before tasting with one of the colleges there ( a possible clue to their quality) and he had less than a quarter empty bottles to taste. 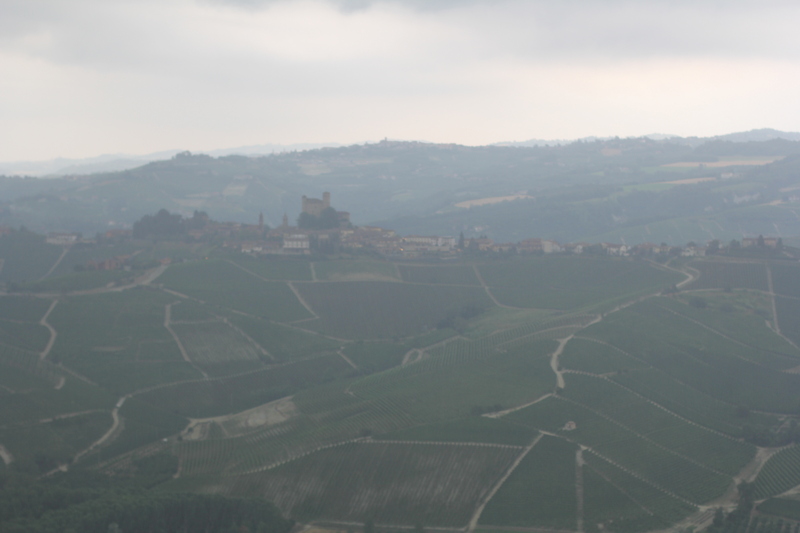 No matter, the wines, despite being shaken and not at the right temperature were very exciting and I was soon to discover that single vineyard Barolo’s are very much where its at in terms of desire and influence. We started by tasting their Langhe Rossese Bianco 2014 from their Rosserto vineyard. This is a rare white grape rediscovered by Giovanni Manzone. This indigenous varietal was saved from extinction in an old family vineyard in Monforte D’Alba. Slightly cloudy yet full of citrus and exotic fruit’s, the wine would be a perfect wine for the new Aperitif bar this summer outside 22 Ritherdon Road. We then tasted another wine from the DOC Langhe, their Nebbiolo ” Il Crutin” 2013 and also a DOC Barbera D’Alba ” Le Ciliegie” 2013 that were beautifully structured. These wine are great introductory wines to Manzone at clever prices. But by far the most individual and serious wines were the Single Vineyard Barolo wines with the 2011 “Castelletto” wine taking my five star award. It was to me what top Nebbiolo should be about, velvety and yet not too fruit driven with some real leather and delicate smokey fruits showing through. I also enjoyed the ” Gramolere” 2010 and this vineyards 1998 and 2007 Reserve. I found the 2009 “Bricat” a little tight and with some tannins so to me it needed anther few years in the bottle.